This featured development is available in FLOW-3D CAST v5.0. Cavities or porosity defects typically form at the last places to freeze. Risers are commonly used to prevent these defects by providing molten metal to the casting as it solidifies. However, for the risers to be effective, they have to be placed at the right locations, with the right sizes so that they contain enough material to compensate for the shrinkage. In FLOW-3D CAST v5.0, two new tools have been developed to help casters design the cooling and feeding systems for defect-free castings: predictions of the last places to freeze and the calculation of the thermal modulus. The last places to freeze directly mark locations within the casting that freeze last and where shrinkage porosity defects are likely to form. Although these places can be derived from the solid fraction evolution or solidification time, a more direct way to visualize them is always preferred. A special type of stationary particles is used to identify and visualize the last-to-freeze locations, called “hot spots”. This output is automatically created when the solidification model is used. 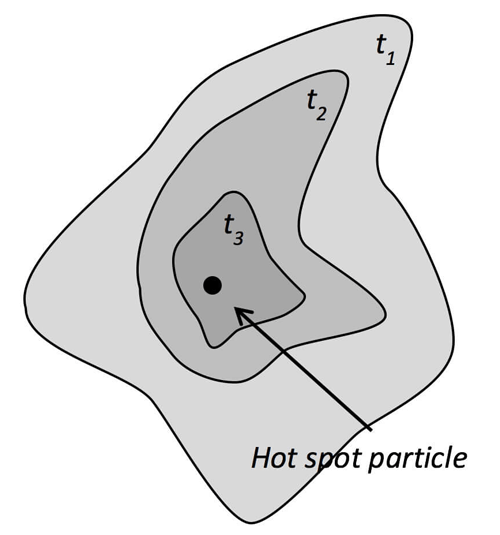 A hot spot particle is inserted into a cell when it solidifies after all its immediate neighbors become solid, as shown schematically in Figure 1.
hsm(i) is the hot spot magnitude for particle i.
t0 is the cell solidification time at the location of the particle. νliq(t) is the volume of the liquid region that contains the particle at time t.
Figure 1. A hot spot particle is inserted at the center of a cell when it solidifies after its immediate neighbors become solid. Figure 2. An illustration of the evolution of the liquid volume containing a hot spot particle: t3>t2>t1. Figure 2 shows illustrates how the connected liquid region volume changes as a function of time for particlei. The computed quantity is then normalized to bring the values of all hot spot magnitudes to the range between 0 and 1. This allows for a simple comparative analysis of different hot spots within the casting with respect to their potential impact on porosity formation. The higher the value, the larger the connected liquid region was during solidification, and the more likely there will be shrinkage porosity defects at the last-to-freeze locations. A is the surface area of the casting part. The geometric modulus of a casting is easy to compute for regular shapes such as spheres or blocks. Anything more complex than that requires tedious approximations of casting sections by regular shapes. Further, the geometric modulus approach relies strictly on the geometry of the casting. Real castings employ chills and insulators to control the progression of the solidification. These features are ignored in the geometric modulus approach. To automate the modulus calculation, and to account for thermal effects associated with chills, insulation, and other mold variations, an innovative approach termed thermal modulus is often used for riser design. 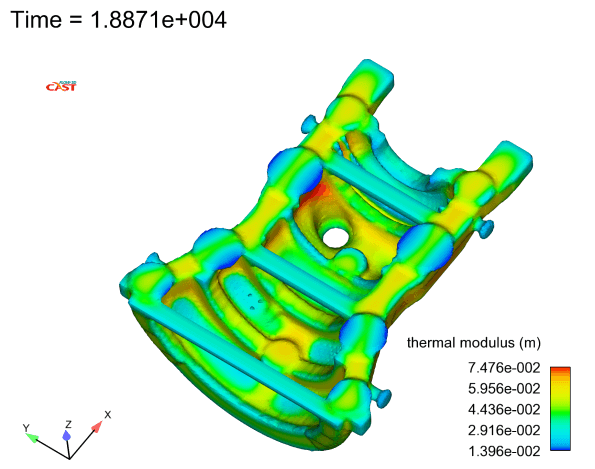 For the thermal modulus approach, first a solidification simulation of the casting is run. Once the simulation is complete, the equivalent modulus throughout the casting can be computed from the solidification time based on Chvorinov’s rule. The equivalent modulus computed using this approach is called thermal modulus. It can be used the same way as geometric modulus to guide the riser design. Tpour is the metal pouring temperature. When designing a casting process, risers are usually chosen in such a way that the solidification time of a riser is longer than that of the adjacent casting section for proper feeding. Based on Chvorinov’s rule, solidification times are directly proportional to the modulus of the castings. Therefore, when comparing solidification times, moduli can be directly compared. Since moduli are only geometric quantities, comparison of the moduli makes design tasks much simpler. Metal casting engineers can design a riser with a larger modulus to ensure proper feeding of the part without considering the specifics of the actual casting process. As an example, the cooling and feeding system design for the gravity casting of half of a steam turbine cylinder using the new tools is provided and discussed in this section, courtesy of Flow Science China. The outer dimension of the part is 2.83×2.34×1.10 meters, and the total volume is about 0.95 cubic meters, as shown below. The casting material is carbon steel, and the pouring temperature is 1530°C. First, a solidification simulation of the casting without chills and risers is run. The purpose is to identify the hot spot locations and to decide the positions of the chills and risers, as well the the size of the risers. The two new tools are used to refine the chill and riser design. The last places to freeze particles are shown in the following figures, colored by the cell solidification time, particle id, and hot spot magnitude, respectively. The hot spot locations and the likelihood to form shrinkage porosity defects are directly seen from these figures. Based on the geometrical feature of the casting, the locations for placing risers are easy to determine, as shown in the last frame of Fig. 4. However, there are a few hot spots on the bottom shell, which are not suitable for placing risers. In order to prevent shrinkage porosity defects in these locations chills can be used to change the solidification pattern, to drive the last places to freeze to the riser area. Figure 4. Hot spot locations colored by three attributes (clockwise from top left): hot spot solidification time, particle id and hot spot magnitude. The thermal modulus computed is shown on the right. Larger values are consistent with the last places to freeze. In addition, the thermal modulus can be used to determine the size of the risers at the hot spot locations. Once the chills and risers are determined, a second solidification simulation with chills and risers is run, to verify the chill and riser design. The last places-to-freeze particles colored by hot spot magnitude, and the thermal modulus are shown in Fig. 6. It can be seen that the chills successfully drive the last places to freeze to the riser area. However, there are still some dangerous hot spots under the risers. In fact, the real casting shows shrinkage porosity defects at the locations identified by the hot spot particles, as marked on the figures below. Note that the last places to freeze are still in the casting, not in the risers. 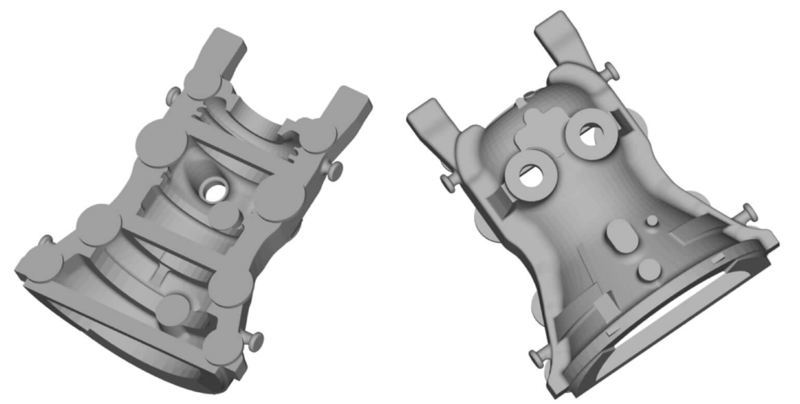 This indicates that although the riser locations and sizes are correctly determined, the solidification pattern is not right such that the casting does not directionally solidify towards the risers. One solution is to use exothermic riser sleeves to correct the solidification pattern. Since this is beyond the scope of this article, it will not be discussed further. Figure 6. Hot spot locations (top left), thermal modulus (top right) calculated with the instrumented casting, and the observed locations of shrinkage defects. Two new tools have been developed in FLOW-3D CAST v5.0 to help metallurgists design the cooling and feeding systems for defect-free castings: the calculation of the last places to freeze and of the thermal modulus. Last places to freeze are the places where shrinkage porosity defects are likely to form. They indicate the locations where chills and risers should be placed. Thermal modulus can also be used to determine the chill and riser locations. In addition, it can be used to determine the size of the risers.